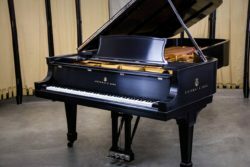 Often referred to as the ‘perfect piano’ the 6’11” Steinway & Sons Model B is a staple of performance halls and professional practice settings around the world. Many professional artists continue to select the Model B as the personal piano. 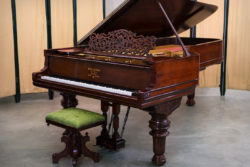 The Steinway Model B is in regular production at both the New York and Hamburg Factories and continues as one of the company’s most beloved scale designs. Built in 1973, this satin ebony Steinway Model B is in excellent, original condition. 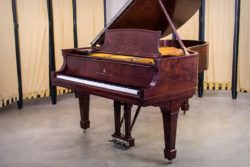 The piano is in a traditional Sketch 380 Sheraton cabinet style with a beveled top lid and square arms, resting on tapered, spade legs. The piano features brass hardware and nickel plated nose bolt caps. Cosmetically, the piano is in beautiful shape and will look wonderful in almost any setting. The action features the original Steinway action parts, accelerated action mounting and has been regulated by our piano technicians. The action parts feature Teflon bushings, however, they have not developed any of the unwanted clicking they are often associated with. The original diaphragmatic spruce soundboard is in excellent condition with no cracks. The supporting ribs are tight against the soundboard. The original hard maple pinblock is in excellent condition and the nickel plated tuning pins are tight, allowing for a stable tuning. 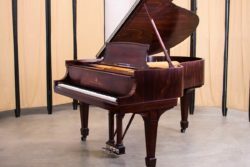 This piano is structurally, mechanically and cosmetically sound and is ready to deliver to your home or studio setting! Carefully voiced and weighed off, this piano now boasts a powerful, full quality of tone. This piano is very playable and enjoyable as it sits, or you can specify any rebuilding/restoration work of your choosing. Contact us today for additional information or to set up an appointment to play this piano for yourself! Founded in 1975 by Master Piano Technician Dennis Chupp, Chupp’s Piano Service, Inc. proudly specializes in the fine rebuilding of vintage grand pianos. With a focus on the piano as a musical instrument foremost in mind, we spend many extra hours beyond the norm, completing fine action and tone regulation. These processes ensure that our vintage restored pianos perform at the level expected of even the most discriminating artist. Over our four decades in the rebuilding industry, we have rebuilt and restored many Steinway, Mason & Hamlin and other brands of grand pianos for many concert artists, venues, and pianists around the country. We understand the nuances and exacting precision needed to ensure a piano that is truly tailor-made for your tastes and playing preferences. 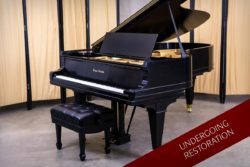 Our rebuilding facility in New Paris, Indiana offers an uncommonly large selection of vintage Steinway, Mason & Hamlin and new Kawai pianos for you to select from. Do not hesitate to get in touch with us if you have any questions or wish to schedule a selection appointment. Error: Error validating access token: Session has expired on Thursday, 10-Jan-19 19:00:02 PST. The current time is Wednesday, 24-Apr-19 23:03:43 PDT.